This image does not belong to the webmasters and is copyright. A real oddity here. Never announced as a Meccano part, the hint we find is that the November 1921 Meccano Magazine advertises the "New Manual No. 3", not mentioned in the previous September issue. Now, Manual No. 3 (which you can find a copy of here) contains a new model number 443, the Theodolite. Although it's not mentioned in the list of parts, the model instructions state that "The cardboard protractors for use with this model are supplied separately (see price list)", and in the price list the last part mentioned is number 135. 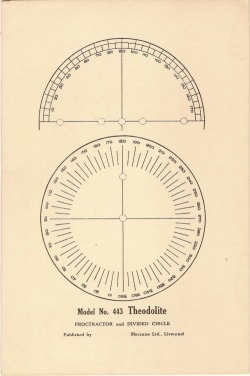 The part was clearly labelled as "Protractor and Divided Circle" (which is what it is), but since the first line "Model No 433 Theodolite" appeared before it, the part became known as the Theodolite Protractor. It is simply a piece of heavy card measuring 9" x 6", with the protractor and the divided circle printed on it. Part 135 last appears on the Meccano price list at the very end of production in November 1941, and never reappeared post-war. The only difference between versions of this part is the information printed at the bottom. It's fairly obvious that the first version of this part is the one with "Model No 443" printed on it. In 1922 the outfits were completely reorganised, and the model numbers changed. The June 1922 new manual includes the Theodolite as "Model 605", and part 135 is now included in the list of parts required. It was included in outfits 6 and 7 from the start of the new outfits in 1922, and so we can assume that it had truly 'become' this part by then. A rearrangement of the manuals in 1927 led to the new style of numbering models, and the Theodolite became "Model 6.5". The following year, with the removal of one earlier model it became "Model 6.4". New batches of the Theodolite Protractor were printed, helpfully including their print dates. The first batch (we think) is dated March 1927, with a print run of 2500, and is labelled "Model No. 6.5 Theodolite" on it. The next, in February 1928, with a print run of 3000, switches along with the manual to "Model No. 6.4" but is otherwise identical. In March 1930 there's another identical print run, although the 1930 manuals move the model to number 6.17 at exactly the same time! There's a reprint of just 500 in 1932, and another reprint, still called "Model No. 6.4" issued in November 1933, when another 1000 were printed. In 1934 (we assume), the last version of the Theodolite Protractor appears, labelled this time "Model K25" (which is at least where it actually appears in the manual, for once). Click on this image to see a larger version. If you want to print out a reproduction Theodolite Protractor for your own use, right-click here and select "Save link as..." (or "Save target as...") then click on OK. Once saved to your computer, you can print it out full size. The outer box should be 9" x 6". The most obvious variation to the Theodolite Protractor, and the one most people might have seen, is the reproduction one printed by MW Models for many years. It is clearly marked "MW Models reprint by permission of Meccano Ltd" at the bottom, but unfortunately this is in exactly the right place to be neatly sliced off by unscrupulous eBayers. The printing of the text, however, is a complete giveaway now that you have these examples to compare them with. The text at the bottom of this example says "Meccano Part No. 135. Meccano Ltd. - - - Liverpool." The other thing you might come across is an "export" version of the same thing. We have pictures in the gallery of the Spanish version from 1929 you can see by clicking here, and a photocopy of the US version (labelled "Model No. 605, so presumably dating from between 1922 and 1927) which is here. Go on then, impress me. These might have been supplied in the manuals, or at the bottom of a box, or potentially (since they were a spare part) in an envelope. One of these would be a bit extraordinary. For identification, each variation has been given a suffix to the main Meccano part number. These suffixes consist of a two-character code for the colour, and if there are many variations, a further number and sometimes letter code to identify each variation. See the bottom of the 'Parts' page for further details. You don't need to worry what the codes are, just click on any one for a photograph. The button above turns on and off the display of DMS numbers (where they are known). The DMS (Development of the Meccano System, Hauton and Hindemarsh) published in 1972 and added to in 75 and 82, suggested part numbers for every variation of every Meccano part. These numbers aren't perfect, but they are recognised and also referenced in the EMP (Encyclopedia of Meccano Parts, Don Blakeborough). Take a picture of the part in very good light, preferably on a plain yellow background, without a flash but with a tripod. Ideally, trim the picture to about 150 pixels per inch of the Meccano part (unless the part is particularly big or small), save it as a reasonably good quality jpg file with a filename of exactly the part number, for example 19b.ni1.jpg, and email it to us by clicking on 'Contact us' at the top of the page. Thanks! A greyed-out box shows that no part exists for that colour combination. Part number codes with a green background have an attached picture of the part, just click once on the code to show a photograph of that part in a separate window. Parts marked "" were temporary or economy parts, or existed only within specific themed outfits. The previous part continued throughout or afterwards. Model 605 Theodolite (1922-27? )was printed with Part No. 135 at base.No print reference shown. Appears to UK edition. I can send a scan if required and if I can work out how. Reply: That looks like a missing version, provided it's for real. Yes, could you possibly scan it and email it (click on 'contact us' at the top of the page) please? Reply: Good spotting Barry, that's also model 508 in earlier manuals. Now we can all make it with our new repro protractors!